Sunday afternoon – we finally got round to clearing up the garden, cutting back the bay tree, the cherry tree and the climbing rose severely and trimming lots of other things. We still have the many pots to sort out, and I can’t quite decide whether to plant out my apricot trees this year, or keep them in their massive pots for another year. Monday – went round to visit Alan and Kat’s baby, Poppy. We took the cutest pink baby Converse in the world, and the cardigan I had knitted, and they were really excited about both. I knew those guys would love the effort involved in hand-knit stuff, and I was right. They were particularly pleased about the colour of the cardi (kind of pale blue-green) as it will match with other things they already have. Tuesday – to Bristol for a regional briefing. Wednesday to Friday – to Birmingham for a SQL Cubes course. It was a long, hard three day course, but really useful for work. It’s also an extra skill for my CV. Today and tomorrow we have a whole list of chores to get through, to do with birthdays, Mothers’ Day, holiday and lots more besides. Then next week is another mad one. So, in knitting news, I’ve been bitten by the startitis bug it seems. Last weekend I cast on a lace stole and also started a jumper. Neither is worth taking pictures of as yet, because I didn’t make much progress before going away. I’m currently resisting the urge to also start a cardigan. I’ve almost finished the baby blanket…but it didn’t seem worth taking a picture of a nearly finished blanket when in a week or so I can take pictures of a finished one. 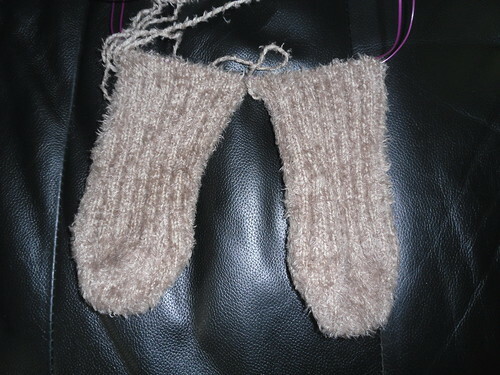 While away I made a little progress on my brown fluffy bedsocks, but they seem to be going soooo sloooowly. I don’t know why that is. Maybe because I’m really not enjoying them. I’m not a fan of brown, but I got this stuff cheap and figured brown would be ok for bedsocks. 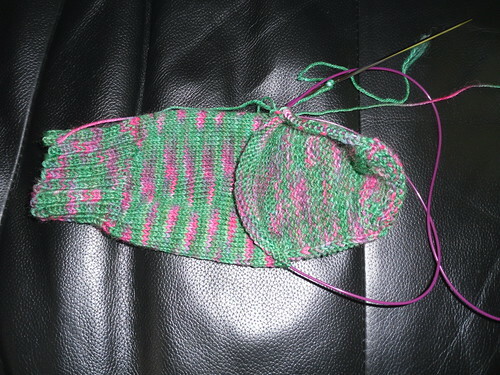 I’m knitting them toe-up, when I prefer top down. Also, I’m doing them 2-at-a-time, which means my progress looks less. They seem to have been going forever but I’m still just on the foot! It’s only one, it’s top-down and it is such pretty yarn. Who’d have thought those things could make such a difference?! This entry was posted on March 26, 2011 at 11:49 am and is filed under Baby, Home, knitting, Work. You can follow any responses to this entry through the RSS 2.0 feed. You can leave a response, or trackback from your own site.